Portland area teachers: The Tillamook Forest Center makes a great field trip destination for those of you using FIRE ON THE WIND in your curriculum. Their short, award-winning film about the Tillamook Burn and the re-planting of the forest is truly inspiring, and the exhibits are excellent. Available at the Benton County Historical Museum in Philomath, Oregon. Check out a "Five Shovel" recommendation on the Wildland Firefighters web page. These books gave me the facts of the 1933 fire. I also re-read, on micro-film, all the newspaper accounts published at the time. For background on life in logging camps, I studied memoirs of teachers and women who had worked as cooks in the big camp mess halls. The question "Where do you get your ideas?" is not always easy to answer, but in the case of Fire on the Wind, I can pinpoint to the day and hour when I realized my next book would be about the Tillamook Burn. Like everyone else who's grown up in Oregon, I was always aware of the story of the great fire. Our parents told us about it as we drove through the burned over stump land in the coast range of Oregon. One day I was driving along, telling the story to my own children, when it occured to me that I had never read a dramatized version of the story, a novel. Suddenly I wanted to imagine the whole thing for myself. Research for the novel included studying the details of the fire itself, logging in the thirties, the Depression, and what life was like in a logging camp, especially for the women and children. Writing this book may have impacted our lives more than any other because by the time I was done, I had thoroughly fallen in love with the idea of planting and growing trees. When we saw land for sale that promised "huge old growth trees" I had to go--"just to look," I promised my husband. Well, we ended up buying that parcel, joining the Small Woodlands Owners and switching from growing fruits and vegetables to growing trees. As a birthday present my husband gave me a long-handled pruning saw, and now one of my favorite things to do is is limb Doug fir trees! My oldest son calls this a "goofy hobby" but I don't care. When I'm doing it I'm happy, and that's what counts. My daughter with my favorite old Sitka Spruce. I imagined the main character, Storie Faye, as my Mary, only a bit older. Since she is much more of an animal person than I am, trying to see the story through her eyes helped remind me to include the creatures that are such a big part of any story about our forests. 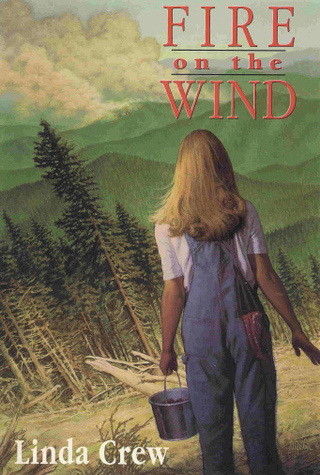 The cover of the new paperback edition features a picture I took of Mary at thirteen, long after the orginal edition of Fire on the Wind had come out, but perfect now since she was just Storie Faye's age. Who could be better as the cover model than the person I was imagining? On August 24, 1933, the fire that had been burning for ten days "blew up." Smoke rose 40,000 feet into the air and ash rained on ships five hundred miles out to sea.